Hello. This is Rory Chasen again. As I've mentioned before, my stories are featured in the Superstition Mystery Series which began in October 2014 with Lost Under A Ladder. We're well into the new year now. In fact, the first month of 2015 is more than half over. And next month, February, contains a Friday the 13th--which will occur before my February blog date here on Killer Characters that, like today, is the 18th. In anticipation, I thought I'd mention it here to prepare you for it, if you weren't already thinking about it. I'm sure that many of you recognize that superstitions involving Friday the 13th say it's supposed to be a day of bad luck. Why? Well, there are said to be religious reasons, and yet the superstition wasn't really recognized until the 19th Century nor popularized until the 20th Century, long after those reasons were said to occur. But books, including one called Friday, the Thirteenth written back in 1907 by Thomas William Lawson, began to mention and recognize that particular superstition and it therefore grew in people's minds as a day of bad luck. Why Friday the 13th? Good question. Apparently some cultures--Hispanic and Greek--consider Tuesday the 13th unlucky instead. And then there's supposed to be a fear of Friday the 17th in Italy. And me? Well, I can't really say that my luck has been worse on Friday the 13th than on other days, but now that I'll be watching for it who knows how bad--or good--it'll be for me? Or you, for that matter. But I'm certain that there'll be a lot of buzz about it here in Destiny, California, which is all about superstitions. You know what? For now, at least, I think I'll stop worrying about Friday the 13th and consequently stop considering whether I have paraskevidekatriaphobia--the word for fear of Friday the 13th. After all, the day after the one this February is February 14--Valentine's Day. There are some fun superstitions relating to that date, especially if you have, or want, a romantic relationship. For example, the type of bird you see, or the color of roses you receive, can help to determine who'll be the love of your life. I don't have a romantic relationship now, though, and am not sure if I'll ever want one again. That's because my dear fiancé Warren died after walking under a ladder, and his death was the reason I had to visit Destiny, to learn about that superstition. Those of you who are familiar with me know that I wound up staying, to manage the Lucky Dog Boutique--and help solve a murder where the shop's owner Martha was the main suspect. Yet I've become friends with the town's chief of police. If I ever changed my mind and thought about a relationship again, I might consider doing so with Justin Halbertson. And maybe then, I'd think first about Valentine's Day instead of a Friday the 13th. What are your thoughts about Friday the 13th and Valentine's Day being so close together this year? 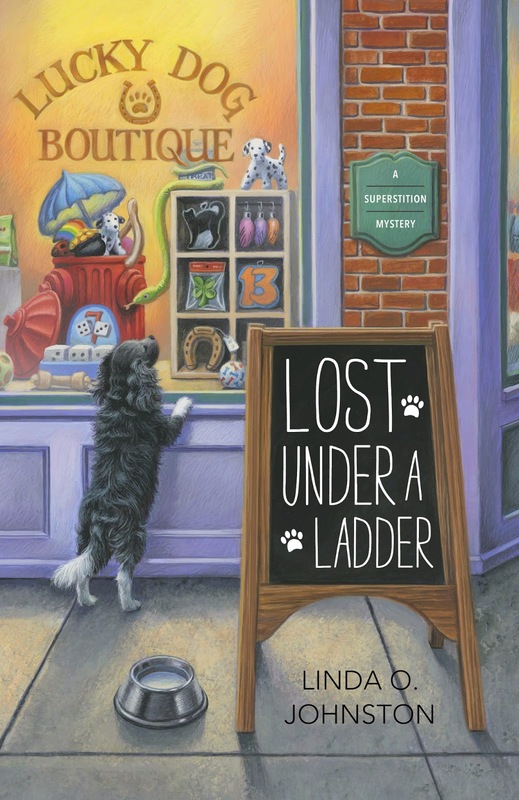 LOST UNDER A LADDER, the first Superstition Mystery by Linda O. Johnston, was an October 2014 release from Midnight Ink. And watch for the next Superstition Mystery, KNOCK ON WOOD, coming later this year. It sounds like a weekend to party! I agree, Willow: that February weekend should be a great one to party. I've read that 13 is considered unlucky in a patriarchal society because there are 13 lunar cycles in a year and that correlates to Women's cycles. I guess if you think that has validity, Friday the 13th (and any 13th) should be good luck for women. I have found it interesting, Libby, that superstitions can vary depending on country or culture. The author who writes about me, Linda O. Johnston, has told me that she's always found the number 13 to be lucky. I have no strong feelings about Friday the 13ths. For the most part it seem to be "just another day" for me. However, beings that Valentine's Day is on a Saturday, I'm thinking many florists will push to deliver on the 13th, so it may be a lucky and fun day for many women. My fingers are crossed that lots of women, and men, too, find both days to be lucky and a lot of fun, Dianne. Ah, then you have good reason to disbelieve in the Friday the 13th superstition, Elaine. That's a good thing!